The flesh isn't the only part of the enormous jackfruit that is edible -- you can also eat the seeds. These are roasted, turned into flour or boiled. Sometimes they're canned in curry, tomato sauce, a sweet syrup or brine. Jackfruit seeds can be a nutritious addition to your diet. A 100-gram serving, or about 3.5 ounces of jackfruit seeds, provides about 184 calories, 7 grams of protein and 38 grams of carbohydrates, including 1.5 grams of fiber, but has less than 1 gram of fat. This is 6 percent of the daily value for fiber of 25 grams. Fiber helps fill you up, making it easier to lose weight, and may lower your risk for heart disease, high cholesterol, high blood pressure and constipation. Jackfruit seeds also provide resistant starch, which may help improve blood sugar control and keep your gut healthy. Jackfruit seeds are good sources of thiamine and riboflavin. Both of these B vitamins help turn the food you eat into energy and keep your skin, eyes and hair healthy. Riboflavin also acts as an antioxidant, helping prevent damage to your cells from free radicals. These seeds also provide at least small amounts of the minerals zinc, iron, calcium, copper, potassium and manganese. Zinc is important for immune function, iron and copper for forming red blood cells and calcium for forming strong bones. You need potassium for maintaining proper blood pressure levels and manganese for regulating your blood sugar levels. 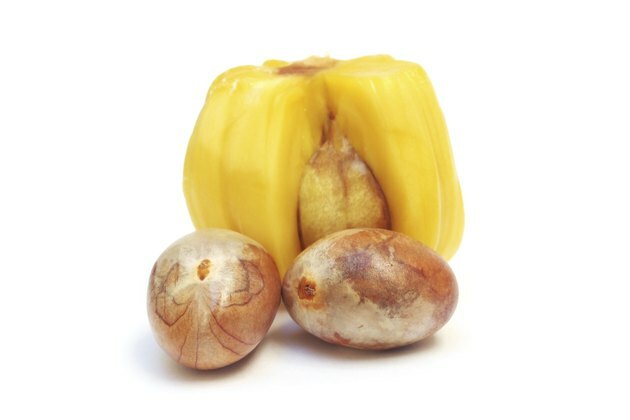 Eating jackfruit seeds will also provide you with a number of beneficial phytochemicals, or plant chemicals, some of which, like polyphenols, have antioxidant activity. Other phytochemicals found in jackfruit seeds include saponins, which may have some anti-cancer activity, and flavonoids, which help limit your risk for blood clots. Jackfruit seeds contain compounds that may have an antimicrobial effect, potentially helping to prevent contamination with bacteria that cause foodborne illnesses, according to a review article published in Comprehensive Reviews in Food Science and Food Safety in November 2012. These seeds have also been used in traditional medicine to help with digestion and treat diarrhea, although more research is necessary to verify these potential benefits.